The Brown Hound features fresh, healthy fare. 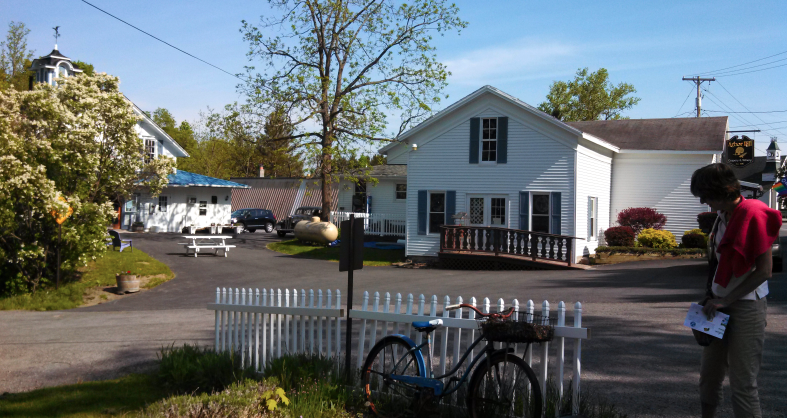 Driving from Canandaigua Lake towards Naples and then veering towards the rolling hills of Bristol we came upon the Brown Hound Bistro — a lovely little restaurant — in between. We did a quick wine tasting at Arbor Hill Grapery, before we walked next door. A Grapery is a store that has LOTS going on with grapes — jellies, candy, gifts and of course wine. The tasting was generous and we sampled cheeses at the same time. The Brown Hound is located between Canandaigua and Naples, in South Bristol. 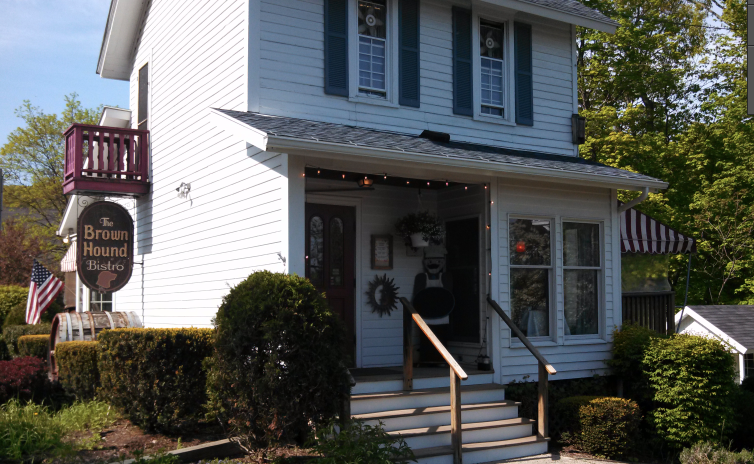 They offer brunch, dinner, and more, all with a focus on local foods and Finger Lakes wines. The Brown Hound is located in a tiny 100-year-old house. We sat out on the wrap-around deck, which was not fancy, but very comfortable. and cool on a hot day. Our waitress was friendly, fun and helpful — answering our endless questions about whether ingredients, checking with the chef through the kitchen window. We sat out back on the deck and it was about 80 outside and was perfect temperature on the shady deck. Starting with local wines and some amazing sourdough bread, we had plenty of time to relax and unwind after playing a round of golf. My top recommendation: the seafood bisque which had a roasted red pepper/lobster taste that was rich and creamy. My husband enjoyed the Wild Mushroom Risotto: Creamy, slow-cooked arborio rice with assorted mushrooms, parmesan, white wine, finished with white truffle oil and vegetable. 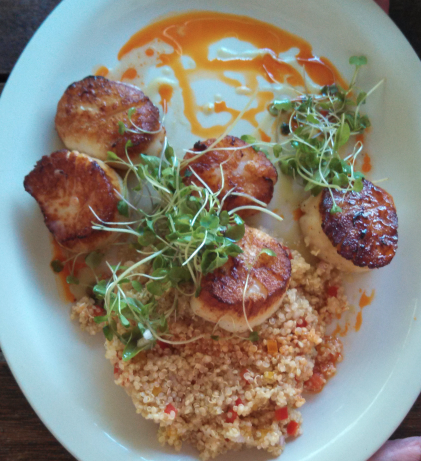 My friend enjoyed braised scallops over quinoa with peppers and other veggies. The quinoa was really tasty. I had a tuna steak (“meh”) with sweet apples and a yummy radish cake (daikon). We ate very early in the evening and I noticed that the tables were filling up early on a Saturday night. The Brown Hound is just a few minutes south of Bristol Mountain ski area, The Brown Hound can be easily access via RT 21 from Canandaigua, or RT 64 from Bristol. 6459 State Route 64, in South Bristol. Call for a reservation 585-374-9771. Entry filed under: beer, Bristol, Naples, restaurants, Wineries. Tags: Canandaigua Lake, Naples, Restaurants, upstate new york. We looked at this when looking for a space for a rehearsal dinner. It’s so quaint and cute!